One of our favorite activities at Secretariat.com are the special events and signing appearances held in conjunction with members of the Meadow Stable team and other racing celebrities. Working alongside these legends who helped make the Meadow Stable a household name in 1973 has always proven to be a cherished occasion - for both our staff as well as the many fans who have joined us to share the memory of a most special horse. 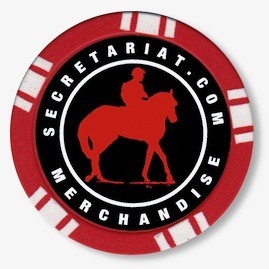 As part of these signing appearances we issue special Secretariat tokens similar to poker chips as temporary receipts for those who purchase autographed merchandise. Invariably we are asked if we will sell the always popular chips and unfortunately we have had to decline...until now. Because we are in the process of replacing our current inventory with a new design, we are now pleased to offer the last of our original tokens on hand and the very same chips held by Penny Chenery, Ron Turcotte, Charlie Davis, Bill Nack and other racing luminaries through the years. These 1 1/2" heavy-duty clay composite matte chips are identical to those used in the finest casinos. On the "heads" side, they feature a graphic profile of the champ along with his name and stable set in white lettering. On the reverse "tails" side is a silhouette featuring Secretariat with Ron Turcotte aboard. Whether you take it to the races for good luck, flip it as an instant "handicapping" tool between your two favorite entries, or simply display it as a collectible keepsake overflowing with Meadow "Mojo," it is sure to offer any Secretariat fan a wealth of enjoyment. Available in your choice of Black, Purple, and Yellow, or order an entire set of three and save 25%, but only while quantities last.